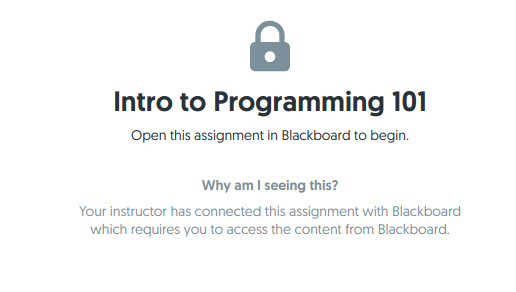 Course integration with Blackboard. If you haven't completed the integration at a course-level, make sure you follow the steps in the link above. Grade syncing works at a project/assignment-level; which means that every assignment and project within the integrated course will require the following setup. 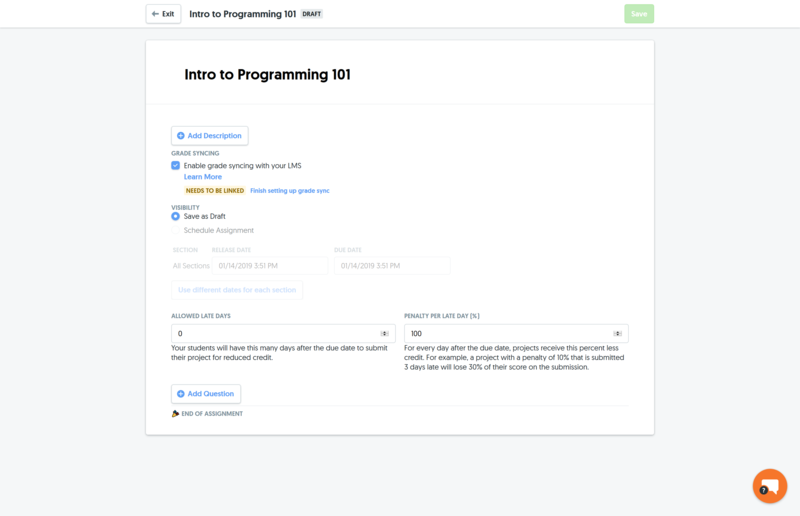 Start by creating the project or assignment in Mimir Classroom and checking the "Enable grade syncing with your LMS" option. 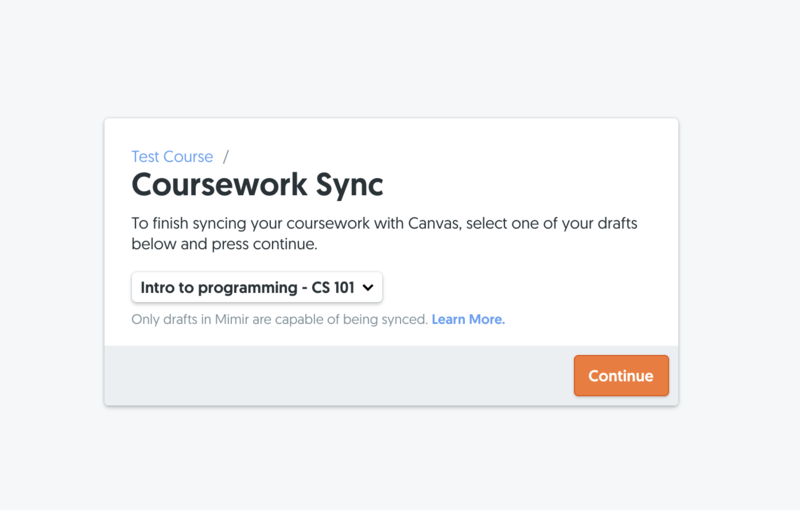 Note: you will only be able to turn on grade syncing while your coursework is in draft mode. It will not be an option after students have submitted work even if you change the status back to draft. 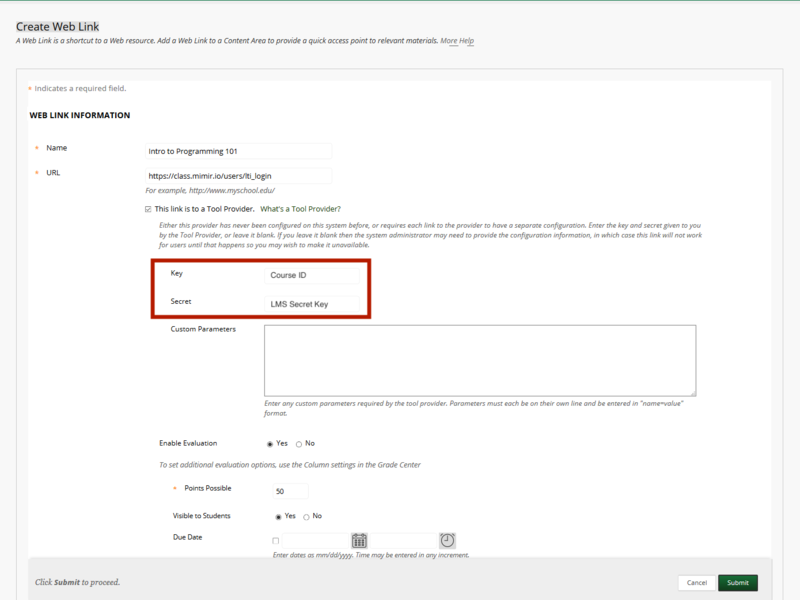 In Blackboard, you will need to create a Web Link under Content. It will ultimately be easier for your students to have matching names in Blackboard and Mimir, but this is not required. Under URL, copy and paste the following https://class.mimir.io/users/lti_login and check "This link is a Tool Provider". The Key and Secret in the web link correspond to your Mimir Course ID and LMS Secret ID that you can find in your Course Details. Mark "Yes" to Enable Evaluation so the link can have a grade attached to it. Note on start/due dates: Start dates and due dates will not sync across platforms. We recommend matching start dates in both Mimir Classroom and Blackboard for consistency. If you use extensions and late days, we recommend setting the Standard Options at the bottom of the page to "Permit Users to View this Content" so the link is always accessible to students through Blackboard. After submitting the Web Link configuration, you will see the link in the list of assessments. Click on the web link you just created to complete the setup. The project/assignment you're syncing will be automatically selected if the names match; otherwise, select the intended project/assignment name. Only draft or scheduled coursework with no submissions will be displayed in the dropdown menu. After you click "continue", you will be redirected to your assignment/project to finish scheduling. If students click the Blackboard link and don't already have an account, one will automatically be created for them. When you're done grading, you can select students and release the grades. Once the grades are released, they will be automatically synced and updated to Blackboard.